Professionaali tasemel diagnostikaseade Volvo automargile. Seade on uus. Garantii 1 aasta. Seade on kohal. Firmadele arve. 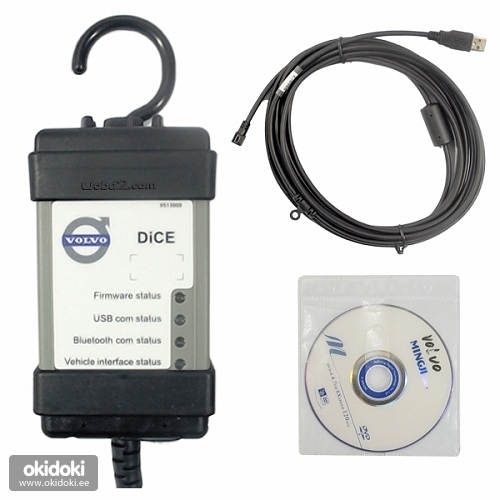 Volvo VIDA DiCE (Diagnostic Communication Equipment) is a tool that is used together with Volvo VIDA All-in-one software to diagnose and troubleshoot Volvo vehicles from and including model year 1999. This is a newest Volvo tool replacing well-known VCT2000 device. 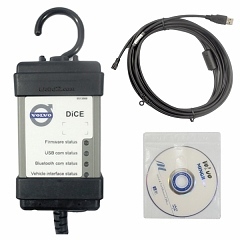 DiCE is connected to the vehicles OBD diagnostic socket. When connecting to the vehicle, DiCE is powered as long as the battery is charged. Device has a folding hook that is designed for hanging the unit from one of the grab handles in the vehicle for example. DiCE is equipped with four status LEDs that indicate the status of the software, the USB communication and the interface to the car. Also there is a DC input where a battery cable or adaptor (12V) can be connected, it is used when upgrading and troubleshooting the DiCE device.